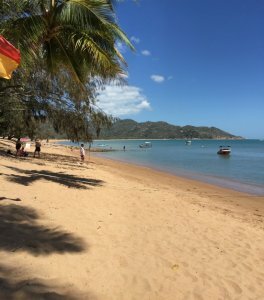 Wonderful day trip if in the Townsville area, the bays provide excellent protection from any wind direction and a far nicer swimming beaches option to the mainland. Our pick was Alma Bay which had a cool breeze, large grassed area with playgrounds and picnic tables. The ferries run regularly so once on the island you can buy a bus ticket and jump between the bays then head back home whenever you're ready. A good chance to spot fish and stingrays in the few shallow waters (30cm deep) on the right side of Gregory Bay, and the water is very warm which our young kids loved. Relaxing experience and well worth the ~$75 for a return family ticket on the ferry for a day out.